They build their gear with high standards and superior functionality. Combining a beast of a power source and large, easy to read display, these are the type of tools you want if you are serious about your sound! Alesis Powertrip 8 Power Conditioner Power Supply & Light Module 1u Rackmount. Gemini PL-90 Power Conditioner and Light Module. Rack mounted. Tested and works as intended. Pictures show the exact item you will receive. Condition is Used. This allows the user to plug in wide power cables and multiple wall wart devices, and still have eight total power outlets to choose from. - Total Power Capacity of 1900 watts. - Power Outlets: 8 rear outlets. Rack Mount Power Conditioner Strip With USB Charge Port SPECIAL OFFER! Features: Universal Power Supply for Electronic Devices & Equipment (3) Front Panel AC Outlets (16) Rear Panel Wired Power Cables, 16’ ft. Integrated ‘Half-Hot’ / Switched AC Outlet USB Port for Device Charging (Works with Smartphones, Tablets, MP3 Players, etc.) Compatible with 1U Mount 2 or 4 Post Rack Spaces Includes Detachable Rack Mount Brackets Ground Lift for Background Noise and Hum Elimination Plastic Cover Encased Power ON/OFF Switch Technical Specs: Universal Rack Mount Size Standard: 1U 15 Amp Circuit Breaker Power Cable Length: 15’ ft. Rear Panel Individual Power Cable Length 4.0’’ & 6. RR-15-PLUS Features The RackRider RR-15-PLUS is the perfect accessory for any rack-mount system. We are not experts in any given field. We want you to be confident when purchasing. Condition: Used. Upon checkout, there there is a handling fee. One big spike and your rig is up in smoke. Furman's standard level surge/spike protection defends your gear from the spikes and surges that are so common at gigs and practice spots. Your mix sounding flat?. We will be responsible for all the loss. We have everything tested and checked before being advertised for sale. Good working order. 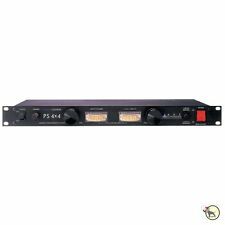 Pre-Owned Furman Elite - 15 Power Conditioner. -Linear Filtering Technologyfor unequaled audio and video clarity. -1800 Watt Maximum Capacity. -Series Mode Protection. For sale, gently used. In excellent condition. 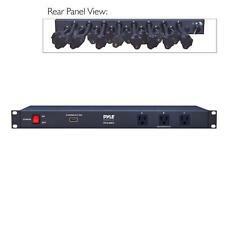 APC-G5BLK-9 Outlet Power Conditioner-G-type, Excellent, Came Out Of Demo Room We have a total of four units. They all work fine. They are in excellent condition other than some scratches on the tops and sides from being moved. They came out of a demo room and were gently used.One unit has rack ears, one unit does not. Two of the units have feet. Please specify which unit you would like. Super fast shipping. Please see our 100% feedback score. The fast acting suppression circuit responds quickly, clamping spikes and surges to safe levels. The filter works to prevent noise from electric motors, florescent lights, and other similar sources from leaking from the AC line into the audio. New IRRADIANT IR-CL-PDP Power Conditioner Light Meter Auth Dealer BLOWOUT SALE!! The following are just a few examples of applications where this unit can be used Authorized Dealer. 8-Outlet, 15-Amp AC Power Distribution & Surge Suppresson. Office Buildings. Weight: 12 lbs. SURGEX FLATPAK SA-82 AC Power Conditioner Tested, Free Shipping! SURGEX FLATPAK SA-82 AC Power Conditioner. Tested Working. Tested for Key Functions, R2/Ready for Resale. Power Cable Included. The pictures are of the actual item(s) being sold. In the rare event of a problem, I can usually correct it quickly. "details about item". The unit also has RFI and EMI filtering, a 15 amp breaker, and a total power capacity of 1800 watts. This allows the user to plug in wide power cables and multiple wall wart devices, and still have eight total power outlets to choose from. Tested and working. Pictures are of the actual SurgeX power conditioner you will be receiving. Works and looks great. This unprecedented level of protection is only available with Furman’s SMP technology. The AC-215A compact power conditioner features Furman’s revolutionary SMP technology. Furman’s SMP surge suppression virtually eliminates service calls. MODEL NUMBER: SX2120. MANUFACTURER: SurgeX. Review pictures for more details. ITEM CONDITION: Used: Good condition. We are not responsible for any typographical errors. Our goal is to provide exceptional service. 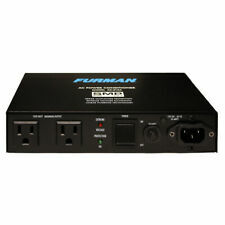 This Furman power conditioner is used but works great. Condition. Warehouse section 9. Everything pictured is included. See pics for quality. Condition is Used. Furman's exclusive SMP technology provides the highest level of surge & spike protection available. Isolated outlet banks minimize inter-component interference and noise contamination. Furman PL PLUS DMC. Important Information. Steel chassis. Outlets 8 (15A). It shall include over-current protection for 15A. COMPLIANCE & CERTIFICATION. Other Outputs: Two AC 12Volt-4 Amp, One DC 24V-1.5 Amp. Output Cut Switch for All Nine Channels. Display Shows Wiring and Ground Status. One Constant Power Jack Output Un-switched on Front Panel. Output Power: 2200W. This bundle includes 1 ART PB 4x4 PRO and a set of Resident Audio R100 Headphones. LINEAR AC POWER CONDITIONER. P-9 PRO SERIES II. GOOD CONDITION. This unit was professionally installed and maintained. All critical circuit functions are governed by an internal microprocessor. The Furman was connected to a power source and supplied power to all outlets. We did not have the resources to test the rack modules. Manufacturer: Furman. Manufacturer: dbx. Linear Filtering Technology (LiFT) with zero ground contamination. Was working properly before removed from service. Pics are of actual item you will receive. Use the RS-4 with all your gear, guitar, bass, keyboards, and P.A. Designed for quick, safe, easy startup of your rig. The golden rule is to "Always turn your main amp on last, and turn it off first" to avoid the potentially destructive loud "POP.". & Light Module. This unit was tested and the tech found that it's working properly, but the left light needs a new bulb. LC-T-4189 (9/L-2x19x11) SL. Salesbaron is in Los Angeles, 90039. ETA SYSTEMS PD11SS Conditioned Power Distribution. MODEL EPD11 PRO SERIES. Powers on, and seems to respond properly to pressing of buttons. We are not able to fully test this unit for all functionalities, but we were assured it was in working order when decommissioned. Includes Detachable Rack Mount Brackets. USB Port for Device Charging. Universal Rack Mount Size Standard: 1U. Ground Lift for Background Noise and Hum Elimination. Integrated ‘Half-Hot’ / Switched AC Outlet.